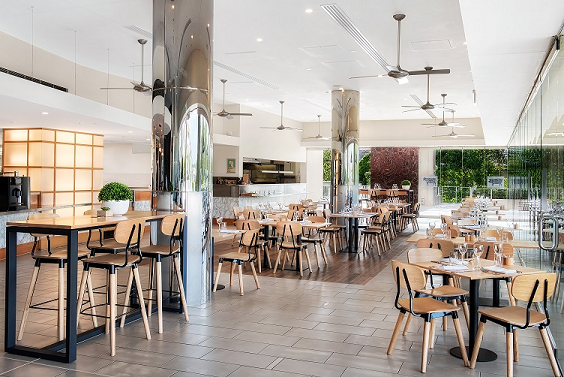 Set in the picturesque backdrop of Pelican Waters with views across the waterway and golf club, The Grill offers a contemporary Australian menu alongside extensive grill selections. Spending much of his career working on the coast, Head chef Benjamin Limpus has created a menu that features the freshest seasonal, local produce and the best cut's of meat from select Australian farms. Dishes like Wagyu Beef Tataki, flame roasted chilli, finger lime, shiitake dust and Manhattan Seafood Chowder, sourdough, matchstick vegetables, prawn oil are just two of the highlights. The signature dish - 100 day Grain fed 800gm Rump for two with chermoula basted Mooloolaba king prawns, roasted potatoes, jus - is must try for steak lovers. The wine list compliments the restaurant menu with a large selection of reds and a extensive cellar to match everyone’s liking. 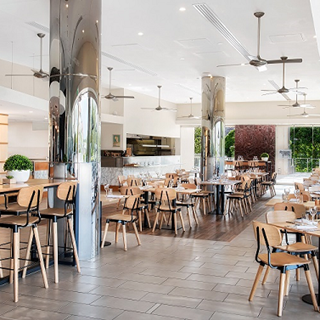 Guests can enjoy pre-dinner cocktails and drinks in our spacious bar or on the terrace whilst enjoying views of Pelican Waters and the lush green golf course. We are sorry but this restaurant is not currently accepting online reservations through ResDiary. What an absolute gem of a restaurant! The menu is fresh, exciting and delicious. Between my partner and I, we enjoyed the Crocodile Tail Karaage, Barramundi, Duck and the Peanut Butter Parfait. All were divine. The service was attentive but not overbearing and, if you can, extend your stay to enjoy the hotel facilities as well! Highly recommended and I can't wait to visit again to try more of the treats on the menu. Excellent food and service was great! Great service, our meals were well presented and delicious. Nice to see staff with personalities!! A great night overall, the food was fantastic. I think better signage out the front of the hotel/parking would be helpful. I highly recommend this restaurant for quality and value. We have dined here a few times now and find the food is exceptional. Service is good. food and service are awesome, very happy. A great restaurant to dine! Can't ask for more, well done to all! Food was lovely service was excellent with lovely friendly staff I would highly recomend this venue. Menu reads really well but we were very disappointed as almost all of our meals were tasteless and unenjoyable. Fabulous and friendly service with great food. Fabulous food with generous portions & fantastic friendly staff. Thank you!! Nice atmosphere, food was great and there was also a great variety of dishes to select from. Good timeframe for food to arrive at the table. Easy parking.